How Art Transformed A Remote Japanese Island : Parallels The population of Naoshima has fallen to 3,000. But this year, its art will attract 800,000 tourists from around the world. "The level of our sophistication has gone up considerably," says a resident. The Chichu Art Museum, designed by celebrated Japanese architect Tadao Ando, is built mostly underground. Open courtyards and skylights bring in natural light. The island is internationally known for its works of modern art and architecture. Art can enlighten, soothe, challenge and provoke. Sometimes it can transform a community. Case in point: a 5.5-square-mile island called Naoshima in Japan's Seto Inland Sea. Once upon a time, the biggest employer on Naoshima was a Mitsubishi metals processing plant. Actually, it's still the biggest employer, just not nearly as big as it once was. Blame automation. The population of the island has dropped from around 8,000 in the 1950s and 1960s to a little over 3,000 now. In Japan, this is not that strange. Populations of small towns are declining all over the country. Some towns are disappearing altogether. The reasons are a combination of the country's overall shrinking population and an increase in the number of people moving from rural areas to big cities. Naoshima might have been headed for the same relentless decline. Enter Benesse Holdings, an education and publishing conglomerate based in the nearby city of Okayama. Its best-known brand is Berlitz, the language school company. Benesse's other claim to fame is its world-class modern art collection, including paintings by Claude Monet, Frank Stella and Andy Warhol, as well as many Japanese artists less famous in the U.S. The former head of Benesse Holdings, Soichiro Fukutake, wanted a special home for the collection, someplace where it would have a local impact and could also be shared with the wider world. 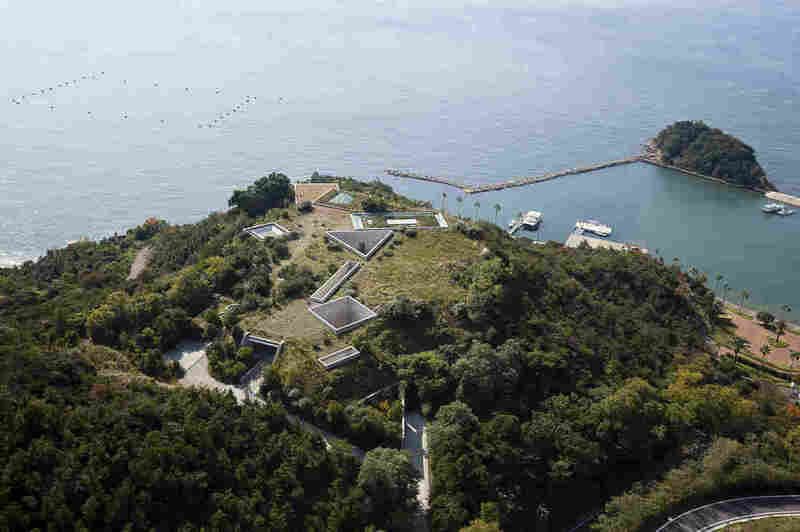 So, nearly 30 years ago, Benesse bought a big hunk of land on Naoshima's south side. It hired world-famous architect Tadao Ando, and over the next two decades, he designed museums and adjacent luxury lodgings. The buildings follow the natural contours of the landscape. One museum is mostly underground, with open courtyards and skylights bringing in natural light. And if you build it, they will come. This year, Naoshima's triennial arts festival is expected to attract at least 800,000 tourists to the island. "Now that we have tourists and a very active tourist industry, some people have moved here to open shops on our island," says Naoshima Mayor Michiru Hamanaka. "Last year, we even saw a little bit of a rise in the population." 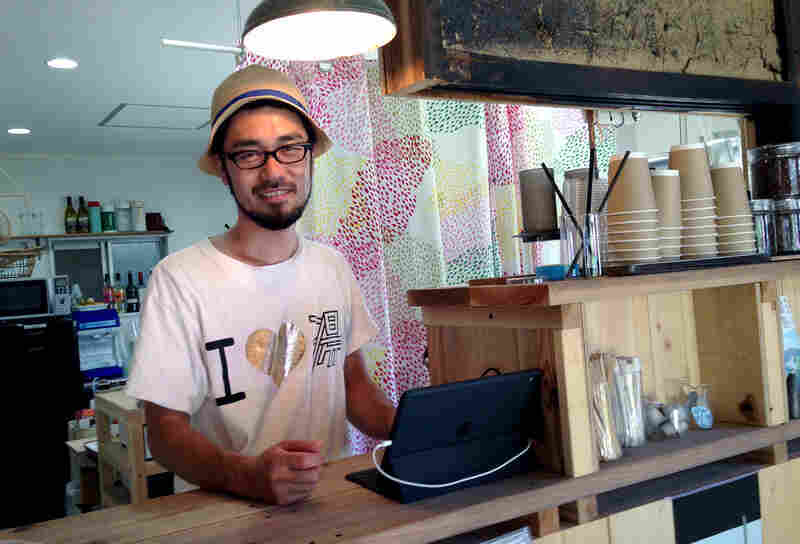 Masaaki Yamagishi, 38, is one of the island's new shop owners. His place, Shimacoya, is part cafe, part bookstore, part campground and part community center, where neighbors gather to learn English or watch movies. 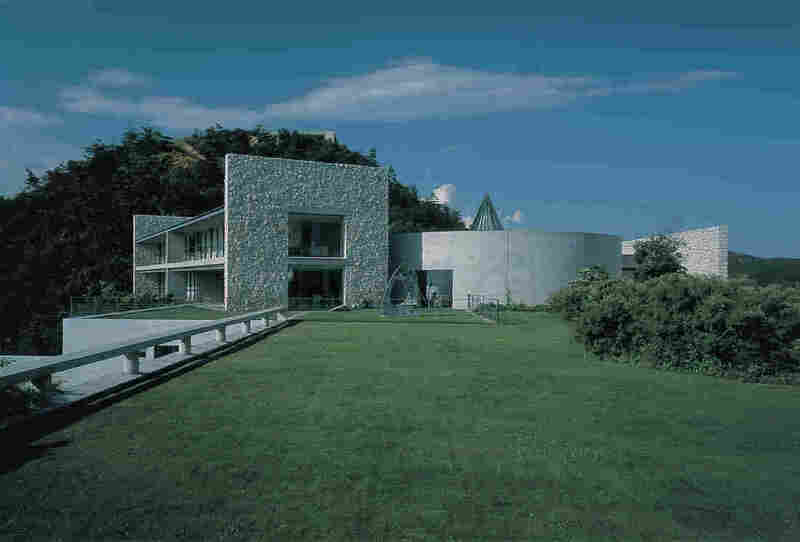 Yamagishi first came to Naoshima from Tokyo as an art tourist. "I was so struck by the kindness of the people and fell in love with the whole island," he says. "And I thought, 'What a wonderful place to be.' "
His cafe is in the village of Honmura. The narrow streets are dotted with abandoned houses. Benesse Holdings bought a few of them and turned them over to artists, who transformed the houses into permanent installations. The "Art Houses" draw tourists from the museum campus into the village. 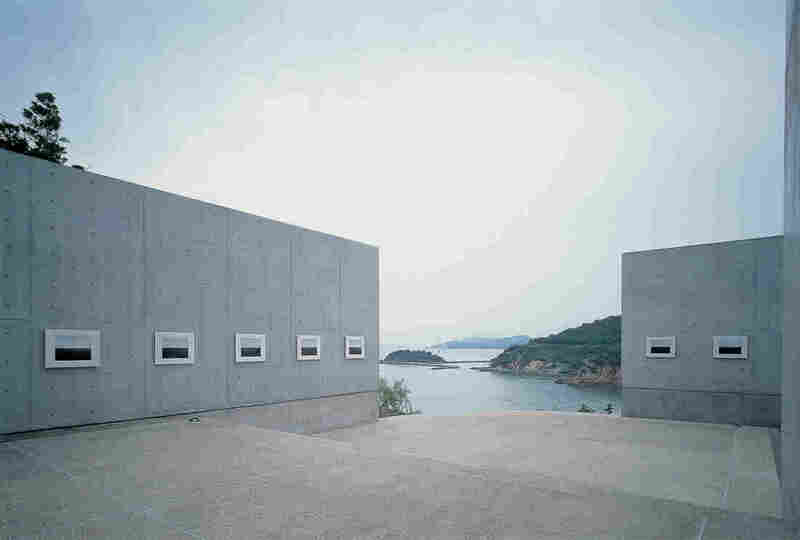 And it has turned Naoshima residents into enthusiastic supporters of contemporary art. One of them is 74-year-old Morohiro Nambara. He's a docent at a house where locals used to meet to play the board game Go. Artist Yoshihiro Suda has replaced the Go parlor with his camellia sculpture. It's juxtaposed with a real camellia tree and with an empty space. You're supposed to contemplate what is real, what is fake, what is art. Nambara likes discussing this with visitors. "At the beginning, I had no idea how to appreciate [contemporary art]," he says. "But little by little, you become comfortable with it and start to grow very close to the artwork here in the town. So I feel like I understand it a little bit better." It seems like you can bump into art anywhere on this island. Benesse has commissioned several site-specific works. Visitors can see a couple of sculptures near the harbor before they even get off of the ferry. A giant red pumpkin covered in Yayoi Kusama's signature polka dots has become a Naoshima icon. A similar piece of hers — a yellow pumpkin on an undeveloped beach — perches at the end of an old concrete pier. Toshihiko Okuda, 80, who retired last year as head of the Naoshima Tourism Association, says art tourism has brought big changes to the island and the lives of its residents. In the beginning, he says, some were skeptical about the Benesse art projects. But they've now had years to see the many benefits. For example, "We're making conscientious efforts to learn other languages," says Okuda. "Even young children in elementary schools are starting to learn English. We want to be able to respond [to a visitor] if asked a question." Naoshima residents are even dressing better, says Okuda, emulating the foreign visitors. 'We feel that we're starting to see things we never knew existed," he says. "The level of our sophistication has gone up considerably." But not too much. 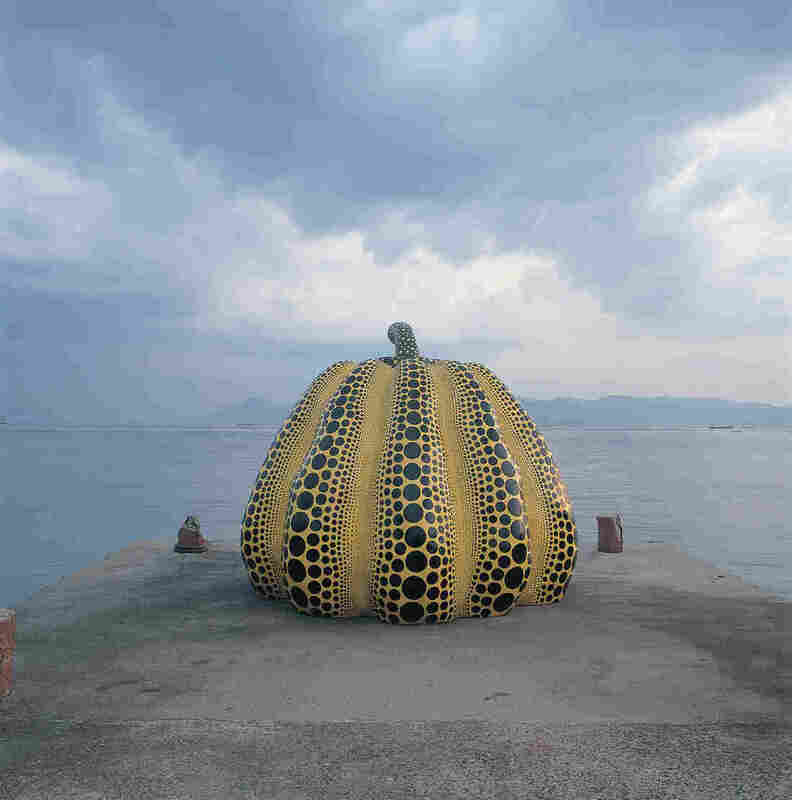 Naoshima has kept its laid-back, beachy vibe — even if gigantic polka-dot pumpkins by a famous artist decorate its shores.